I stitched on a mere two BAPs for Amazon April and both were Round Robins! The first was Julie's Angels piece for which I stitched the Archangel Michael, it does make a nice change to stitch a male figure rather than the usual elegant lady. I won't be able to just pick one colour for all my pieces as I have another RR to stitch and various multi-coloured pieces too. Green Goddess fits the theme though and my Scarlet Letter sampler which is currently all scarlet although eventually there will be more colours! 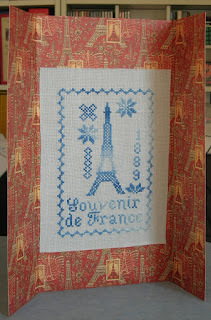 I've also been drooling over the freebie from Alessandra Adelaide on FB as stitched by Nic the Obsessive Cross Stitcher on her blog. She's used a gorgeous rainbow thread hand dyed by a friend new to the business, find Jodyri Designs too. While you're on FB you can also sign up for Thread Pickerz freebie Hearts SAL starting soon, 2 little hearts a week for 8 weeks. I know a lot of people don't like Facebook and to be honest I don't blame them! There is more bitching, flaming and politics going on there than any of the blogs or forums I've used. People seem to take umbrage more quickly too. I got flamed once for idly asking people what I should stitch that evening and not posting photos of the choices!! Apparently I wasted someone's valuable time! Anyway there is a lot of good stuff on there too if you stick to the stitching groups or the cute cat groups. Even there though someone complained that the LOLZ Cats can't spell! Er, that's the point of it... You don't have to have loads of personal stuff on there, you don't even need a photo, I have a picture of my stitching and you can block all the annoying games too. Finally, it's May Day tomorrow so don't forget to get up early and wash your face in the morning dew. Or the morning frost in our case! Can you hear the Happy Sound of Happy Feet Happy Dancing? I have finally finished Sophia's Band Sampler!! In 2011 Sophia sent round an amazing Teresa Wentzler piece. It was the first time I'd stitched in a Round Robin and I was really extra careful to make sure my contribution was as good as I could make it. Extra hand-washing, every stitch railroaded, any frogged thread discarded and not re-stitched with etc. In 2012 Sophia promised us something easier than TW and came up with a Celtic Knot design in rainbow colours. I was the last person to stitch on it and unfortunately we did not gel. Maybe it was the fractionals, maybe the yellow, maybe the repetitiveness, maybe it was Archangel Michael calling to me from his bag but whatever it was it took me some time. I received the piece in February a week before it was due to be mailed back to Sophia and here we are two months later! So technically I'm only 3 weeks late... Bad Stitcher, Naughty Stitcher, no Stitcher Treats for the the Late Stitcher. Sophia is planning to put all our names or initials in the space in the middle. Probably with a black mark next to mine. Angi sent the threads she wanted us to use, they were all beautiful to stitch with, like a miniature Needlework shop in an envelope! The broader cross stitched bands are from the Antique Lace Band Sampler by Northern Expressions Needlework. I changed the colours to suit Angi's palette. The narrower speciality stitch bands are from Just Nan Summer Sampler. This is part of a design called Celtic Leaves also from Northern Expressions Needlework. I changed the colours. Later on Karen backstitched it for me because everyone else had used backstitch and I asked her to make mine match. This is from The Sweetheart Tree using Karen's choice of Summer colours. I told a little story with my bands. First you have the blue sky with white fluffy scotch stitch clouds. Then a row of yellow sunshine above a pink hedge. There is a floral garden with a green lawn in the middle and a little blue stream along the bottom of the bands on either side of my name. This is Indigo Rose's Autumn. Someone also will stitch the other half and the rest of the Seasons. I chose Autumn because I'm an Autumn Baby and I love the colours in this one. Kathy chose the Sweetheart Tree Hearts. Mine is the Mayflower Heart. The gap in the centre is for Kathy to add a charm. There is not a single cross stitch in these bands! They all came from an Indigo Rose sampler called Margaret. Doesn't it look amazing? The theme was Purple with an Accent. The fabric is a piece from Sparklies called Purpleberry Spludge. Each stitcher used mainly DMC 333 plus an accent colour of their choice and a metallic and beads if desired. I'll put close-ups on my Happy Dance blog is you want to see the individual bands in more detail. I'm thinking of adding some beads to my part at the top but I wanted to include the photo in this summary. Thank You all for such an incredible piece, I really love it and can't wait to get it framed and on the wall. Finally, if you want to see all the finished samplers in their full glory then pop over to the Yuku Board and the part just for our Band Sampler here. There are also boards there for the Large Mirabilia RR I'm taking part in and the Joan Elliott RR about to start. Happy Browsing! I have actually finished one of the items on my list of 13! The Lizzie*Kate design Spring. I thought I'd add as many of the gifted charts to my list as possible this year as a little Thank You to the people that had sent them to me. 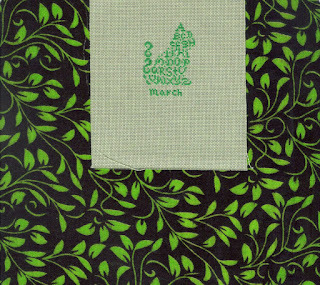 You've seen Spring already this month but as I haven't stitched on anything else from the list this will have to do! I'm hoping to get into town this week and buy a nice Spring themed page for my scrapbook so I can mount this one, the San Man design, the Twisted Threads and the Needlecraft Haven Challenge altogether. You'll see the Needlecraft Haven piece after the Big Reveal this Sunday. Christine is very strict with us, dentention for anyone revealing themselves their stitching early! I did look at all the designs on my list and thought about fabrics for them. I have a £10 voucher for Willow Fabrics and I'm trying to choose some linen. I'm looking at 35count Edinburgh and I'm torn between the neutrals; Mushroom, Sand, Summer Khaki or Flax. Any opinions on which would be more versatile? They all look nice and I just find it hard to decide between items of equal worth! So whichever gets the most mentions will be my choice. It's either that or get half a metre of 32count Tobacco in the sale but there's no picture! Finally I have discovered that Just Cross Stitch no longer allow people in the UK to subsribe to their magazine! My sub ran out last issue and I received an email inviting me to subscribe and get a free copy. I thought this was odd as I'm already a subscriber! I went into the website and found my sub details had "expired" on there which was accurate but there was no way to renew. I emailed JCS and they said to use the offer in the email. So I clicked on the link, filled in the details then got the Country box which gives the choice of USA or Canada. No UK anymore. Now I know we're going down the pan financially but I don't think we've totally vanished off the planet yet! So I'm waiting to find out why I can't resubscribe. Very disappointed. They could at least have emailed or written to their UK subscribers, they have our addresses after all! There is a UK based website that can sell me a subscription. It costs a little more and I'm not sure if the Christmas Ornie issue is included as they only refer to 6 issues a year. I'll wait and see what JCS say first. I posted the photo of all four kitty ornies so far on the JBW Facebook page and got an email from Judy Whitman herself saying how much she liked them. It's always nice to have contact with the designers and show them how you've stitched their work. I'm so happy that the internet has made this possible. If you're thinking about sending a designer a photo of your work then do it, they love feeling appreciated! Here is the fourth Dragon Dreams FB exclusive Dragonlet of Christmas with his Four Calling Collie Birds. A Collie Bird being a blackbird. The choice for the Hallowe'en SAL was a free choice this month and unfortunately I have just run out of time! I've been stitching Easter themed items and prizes for my Giveaway so I think I'll skip April and dive straight into May's choice which is Ghosts. Sunflower Diaries has designed a nice little ghost which I may stitch. Short post because I had some treatment at the dentist which necessitated IV sedation for the second time in two weeks and I'm quite drained so off for an early night. Finally Ziggyeor posted a great link about things that make her go squeeeeee or as she puts it, do a Kermit Flail! Check this post and the link to her Pinterest Board. If you Fail to Flail at at least 50% of the pinned items then you are not a Geek and can't play in our Geek Closet! 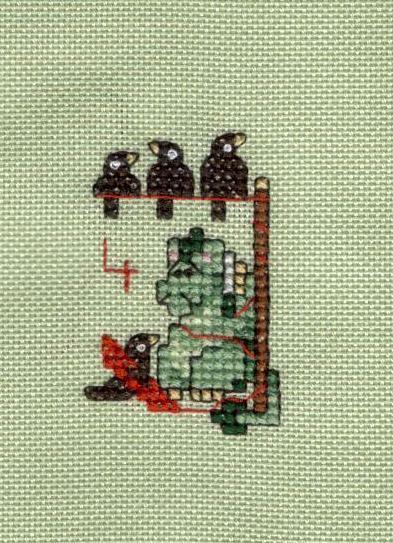 But you can still come share the stitching, Geeks are nice like that. We finally have some nice weather and I've been stitching some lovely Spring themed pieces, most of which I can't show you yet because they are giveaway prizes. This is a Lizzie*Kate design called Spring. I received it in a giveaway from Sarah Crafty Moo. I changed alot of the colours as the original is very dark for a Spring design. I used the same threads as the San Man Easter design I recently stitched because they are on the same fabric and will be scrap booked together. The little bunny charm comes from Ang's Attic, a great online store based only a few miles from where I live. You can get a small bag of 6-10 charms for only £1 and there are loads of different designs. They mainly sell beads for jewellery making and have a good FB page for their beading fans. They also have a forum on the website for those of you that don't FB. Yes, I coloured it in using a fabric pen! I stitched the house first then had the idea. I counted the number of threads needed for the hill and marked it on the fabric then just coloured it in. Then I stitched the path, carrots and flowers on top. Saved me hours of boring stitching. This one shows Four Calling Collie Birds. A collie bird is the traditional name for a blackbird but over the years the word has changed to "calling". Dragon Dreams have gone for both meanings ancient and modern; four blackbirds calling on the telephone! The picture reminds me of the telephone cable leading to our house which always has a few pigeons and collared doves sitting on it. Pre-fibre optic day our internet connection varied according to if there was a bird there or not! That's how fragile it was. Now we can actually stream Youtube much to the Small Boy's delight. For those of you with young children I recommend Barefoot Books' video clips. I also recommend the actual books themselves, alot of them feature soft sculpture and collage pictures, beautiful to look at and lovely to read aloud. Finally, via FB this week I discovered a fellow cross-stitch scrap-booker - Inside Number Twenty. Monique has been scrap booking much longer than me and has some lovely pages. Very inspiring. The first BAP is the Large Mirabilia Round Robin. We decided to make the boxes twice as large as usual (5,000 stitches rather than 2,500) as we could fit more of the design in. There are three groups of four stitchers and we get 12 weeks to stitch rather than the usual 6 weeks. Even so, of course, I was still stitching almost up to the limit! Julie chose Angels as her theme and designed this incredible layout herself. The fabric is PTP Heather Lugana and is really soft and lovely to stitch on. Archangel Michael is one of the less stitched Mirabilia designs which is one of the reasons I jumped at the chance to stitch him. I don't think I'd ever do the full piece for myself but it is nice to stitch something different. There is a ton of metallics, beads and treasures even in this small piece of the design, 12 of those little topaz diamonds for a start. That's it for this theme so far! I still have Sophia's Band Sampler RR glaring reproachfully at me from the corner of the room so I must crack on and finish that next. 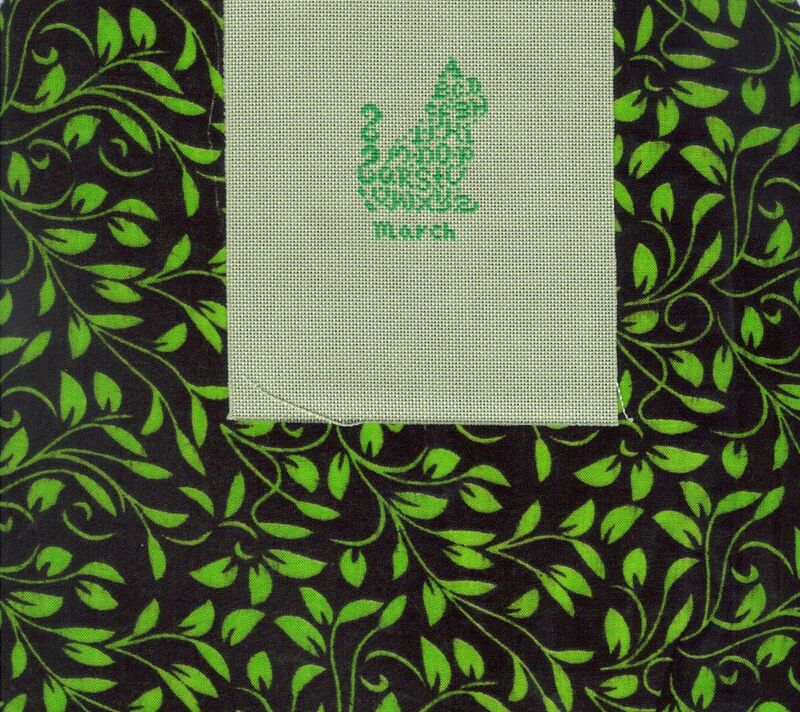 Then the choice is between Joan Elliott's Green Goddess and the Scarlet Letter Sampler. Difficult decisions indeed! Thank you all very much for your Congratulations on my recent Blogaversary. I'm glad you liked the cute photo, I have cute photos of me up until the age of 7 or so, then I'll just post a picture of a cake or something LOL. It was great to read about all your progress (or lack thereof) since last Easter. I remember alot of the projects so I must have been paying attention throughout the year. Finally, I just noticed a few more followers have joined me, heading towards 400 now, so there's another excuse for a little giveaway. I'll wander off and try think of something interesting to ask you all. You don't get anything for free on this blog, you have to work for it! This is April's TUSAL, posing with the two uncompleted Spring/Easter designs I started as part of March Madness. The picture in the frame is a Travelling Pattern started by Cucki. I'm not sure where it has reached now! This is a freebie from La Contesse's blog. 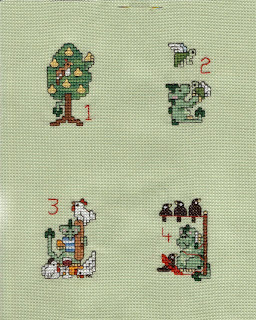 I changed it slightly to make it square and added a little witch charm instead of the charted stitched bats. It is stitched over 1 on 28count burnt orange Jazlyn. Several people are taking part in the Hallowe'en Ornie SAL and post regularly but there aren't many Followers yet. If you're a fan of Hallowe'en I do recommend following the blog just to see all the lovely designs there, even if you don't need another SAL challenge! Thank you Christine, the answer was indeed "Dancing Daffodils", a sight usually seen at this time of year but not under the snow so many of us have had. The only reason we've not had snow here is the wind has come straight from Siberia and blown it all inland! I did the draw this afternoon, aided and abetted by the Large Boy. There were 15 picture posters and 37 correct answers (zero incorrect ones!) so we simply assigned everyone a playing card and picked 2 at random, one from each category. The winners were 2 of Clubs and 9 of Spades, aka Lynda and Linda! 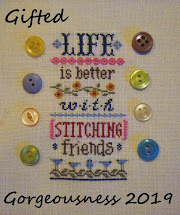 The first Lynda blogs from her Cozy Little Place for Stitching and the second Linda says SUch is Life. I'll be in touch soon to discover your addresses if I don't already have them. Thank you to everyone who entered this year and to all those who became new followers for the participating blogs. It's a great way to discover new friends. Finally, my Blogaversary Giveaway is still open. See the previous post for the competition question. Another big Thank You to everyone that has shared their answers already. It's so much fun to find out more about you all. I couldn't find a photo of me and my cake, but this is my 2nd Birthday present, my trike. Each one of those wheels was a different bright colour. 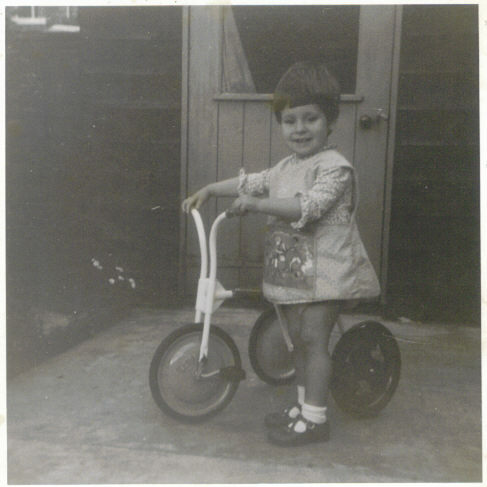 I hadn't forgotten my skirt either, this was the height of the swinging 60s and skirts really were that short! While I think of it - Happy Birthday to Calamity Jr and Susan Yellow Flower Meadow too. 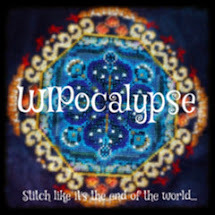 Back when I started this blog I was stitching Mirabilia's Bluebeard's Mermaid and the Dark Alphabet from A Note of Friendship. A year later my Mermaid was finished and framed, the Dark Alphabet was close to completion too. So far so good! My only other WIP from the beginning of the blog is now officially a UFO, an Art Nouveau Head stitched on aida. My WIPS from one year ago are slightly more embarassing, Green Goddess and My Lovely Sewing Tools are still unfinished, but on the "13 in '13" list for this year. What were you stitching on last Easter? 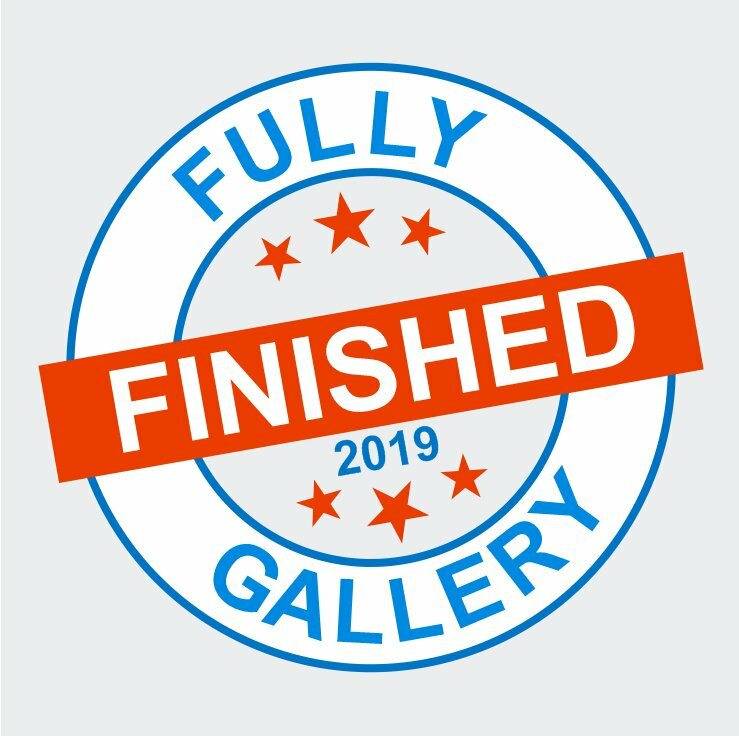 And is it finished yet? A WIP or a UFO? Obviously if you have a blog this is an easy one to look up, but don't worry if you don't have one. Just have a think back to last Easter, or look at your photos from then and see what you can work out. After all, if you don't have proof, it's not like I can say "you made that up!" This is just for fun LOL. A winner will be picked next Sunday 14th April and they will get a small something. Not the Small Boy, you can't post livestock as I'm always telling the Large Boy when he suggests it! The other big announcement, the Easter Treasure Hunt Blog Hop winner will be coming later this week! I'm too old for too much excitement in one post LOL. Besides, I'm giving you until midnight BST to enter the competition, this is your final chance. Finally, Sunday was Finishing Day again. Funny how Sundays often seem just right for a little sewing. I found the backing fabric for the March JB cat and make him into a little ornie, and to sit next to him, the April cat. Although Easter was in March this year, it is more often in April so I went for a Chocolate Cat! 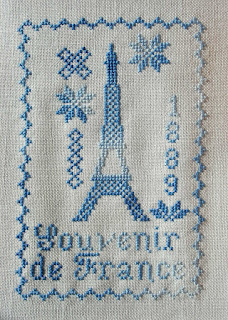 When I was deciding how to finish the piece I remembered that Giovanna had recently spent some time in Paris. 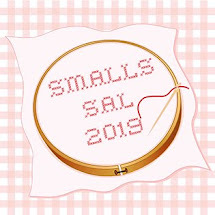 She is a great stitcher and blogger who always leaves nice comments and very kindly sent me the charity charts from last year's earthquake fundraiser. So I thought I should send her a special "Just because we're friends" card. 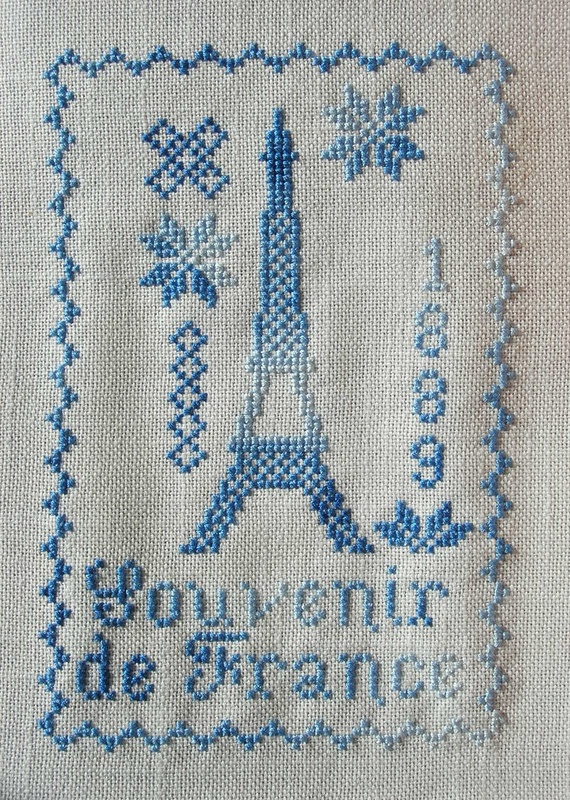 I stitched this on pale blue 28 count evenweave using a DMC variegated blue. Seems like blue was a popular choice if you look on the forum! I mounted it on some nice Eiffel Tower card (the back has sepia schematics on it) and made a simple card, popped it in an envelope and off it went. Then I returned home, plugged my camera into the computer and realised... no photos! So this is one that Giovanna kindly sent me. Look what I won! Many of you know that we've been having internet problems and last week I plugged the mobile phone dongle into the laptop to find it was all used up. So off I trudged to the corner shop to buy a top-up. The assistant persuaded me to buy a raffle ticket, and the very next day I got a call to say I'd won! The small piece in front of the basket is one of my March Madness starts, a San Man Originals design called Easter (how do they think up these names?). I stitched it on yellow 28 count evenweave, over 2 using the recommended DMC but changing the words and border to variegated DMC. Aren't the little buttons cute? This will be mounted along with the other Easter / Spring pieces in my scrapbook once they're all finished. The Easter Treasure Hunt Blog Hop is still open, competition closes 8th April 2013. See post dated 29th March for all the links. 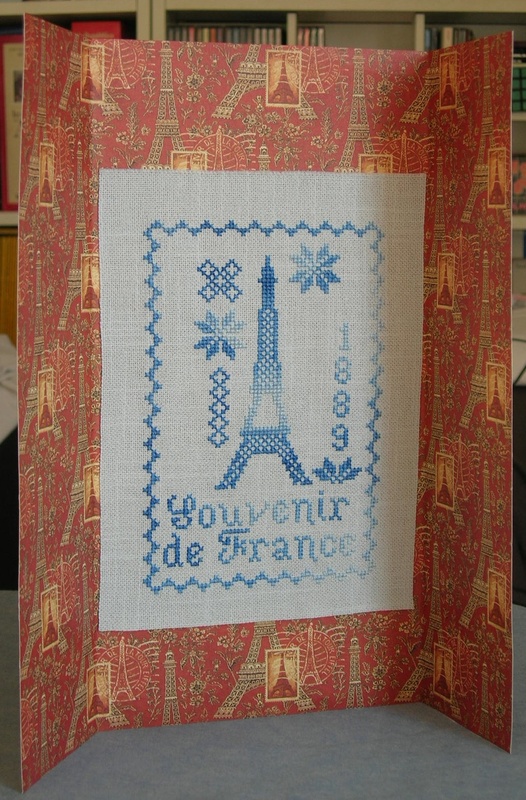 Finally the lovely picture was shown on Needleprint's blog recently. I'm not sure if I can copy the picture, so here's a link, I guarantee it will make you smile.